Carers can be wives, husbands, partners, parents, daughters, sons, or neighbours who look after a relative or friend of any age who has: a physical disability, a learning disability, mental ill health, dementia, is dependent on alcohol or drugs or who is elderly and frail. Caring for someone can be very rewarding, but it can also be very demanding. You may be worried about the person you care for, your finances or your health. You may be tired or under stress and you could benefit from having someone to talk to. We offer support to carers (from ages 8 years upwards) by looking at each individual caring situation to establish how we can support you and to improve your quality of life while you are caring for someone. We are part of this one stop shop approach for carers to access support services: it brings together Glasgow City Council (GCC), Glasgow HSCP, Acute Division of NHS Greater Glasgow & Clyde, (NHS GG&C), the network of voluntary sector carers centres and condition specific organisations who have worked together to re-shape carer services and make best use of available resources. 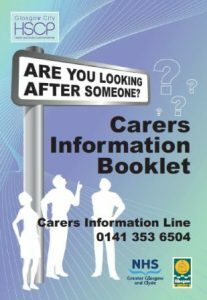 Through the Glasgow Carers Partnership, a universal offer of support is available to all identified carers and once a completed Carers Self- Assessment is received (please see link/download below), carers will be allocated a Carer Support Worker to complete a Carers Assessment and Support Plan. This not about judging you, it is required to establish your caring role, discuss your needs and identify support. Information and Advice – we’ll help you cut through the bewildering range of services and supports available to identiiy the things that YOU need. Come to our surgeries, phone us or arrange a home visit. Carer Breaks – get a short break from your caring role or a much needed holiday/activity break and use an approved care provider who will look after the person you care for, ensuring they are safe while you are out. Short breaks are time limited but will allow you a little time out for an activity you may not have attended otherwise or just to spend some time away from your caring role. Or get a Carers Privilege Card which gives a discount on some council services. Income Maximisation – get a welfare benefits check-up to ensure you and the person you care for are on the right level of benefits. We can also refer you to partners for financial resilience advice, additional benefits applications or help you apply for one off grants, for example to purchase specialised pieces of equipment to assist the caring role. Information Sessions and Training – come along to sessions on mental health first aid, stress management, challenging behaviour, carer’s rights, confidence building, moving and assisting, personal development as well as illness specific awareness sessions and much more. We’ll help you attend if you need transport or respite care. Emotional Support – we offer support on a one to one basis or within our carer support groups. We can also refer you to specialist providers offering emotional support, stress management and therapies, and/or refer you for a Carer Health Review which looks at how your caring role is impacting on your health and wellbeing. Having a Voice – we provide a platform to assist carers to help have their voice heard. We also encourage carers to take part in the many consultations events/forums on offer (at a local and national level), for example the Carers Forum which feeds into the Glasgow city wide planning structure for carers. Community Connections – through effective signposting, social media, referral and joint working with our local partners, we will ensure carers have access to resources and support to access local services and engage in local activities. If you do not live in either the South West or West of the city, we can signpost you to your nearest service. All our services are confidential and free of charge. Please note that Volunteer Glasgow Carer Services complete Carer Support Plans on behalf of Glasgow City Council, and by agreeing to a Carer Support Plan you are agreeing to the Plan to be shared with Glasgow City Council. The relevant privacy statement is available which confirms these details – you can find more details of the council’s role on the website details: www.glasgow.gov.uk/privacy.